Recent works of fiction and popular history have promoted the idea that the Holy Grail symbolizes a physical bloodline resulting from the union of Jesus Christ and Mary Magdalene. This, supposedly, is the 'secret' that esoteric movements have kept tirelessly for the past 2,000 years. From her groundbreaking research, Sylvia Francke exposes this notion to be a blatant misinterpretation of the mystery traditions that preceded and ran parallel to the birth of Christianity. She traces the ancient spiritual paths of knowledge from the Cathars, the Knights Templar and the enigmatic Rosicrucians, to the work of Rudolf Steiner in the twentieth century. Here, she concludes, is true Grail knowledge: the Tree of Life and the Holy Grail itself explained in their metaphysical context. From her research she suggests a solution to the riddle of the sudden wealth and strange behaviour of Bérenger Saunière, the mysterious priest of Rennes-le-Château in southern France. 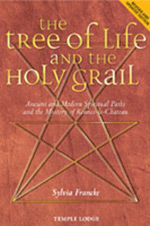 he recent explosion of interest in an alternative history of Christianity - the shadow Grail - prompted Sylvia Francke to revise The Tree of Life and the Holy Grail, first published in 1996. The result is a completely reworked and expanded book that constitutes a powerful and convincing refutation of distorted esoteric truths. SYLVIA FRANCKE studied for the stage and trained to be a teacher of drama at Rose Bruford College in Kent. She is a writer, lecturer and a trustee of RILKO (Research Into Lost Knowledge Organization). Any spare time she has is taken up with her ever-expanding circle of grandchildren.